Generic local business videos: will these work? Local business directory site MerchantCircle has teamed up with Spotzer to offer small businesses semi-customized video ads. These ads are displayed alongside the company's details on the MerchantCircle site. You can see an example of these ads on this listing for Jump Palace in California. Although we like the idea of offering businesses the ability to add videos to their business listings on the Nelso sites (check out this video for the Museum of Communism in Prague), we wonder if the generic videos that MerchantCircle is providing will be effective. Take the case of the Jump Palace ad mentioned above. The entire text of the voiceover for the ad is "Looking for something a bit more entertaining? ", and then the name and address of the company is shown on a black background for the last few seconds of the ad. What exactly this company does or why I should buy from them is not mentioned, because this ad was not made specifically for Jump Palace - they simply chose from a catalog of pre-prepared ads with generic voiceovers, and then added the company name to the end of the ad. Will these work? Do users like video so much that they'll watch a video that really has nothing much to do with the company being advertised? Probably yes. We find it hard to believe that MerchantCircle and Spotzer would bother with these kinds of videos/ads if they didn't work. Users must like them for this campaign to make sense. According to MerchantCircle, more than 2,000 businesses have put together these generic business videos, so obviously businesses like them. We find this very encouraging. We have started to offer businesses professionally produced, custom-made videos, and for the attractive price of free. If generic ads will appeal to consumers, then our custom produced, information-packed videos should perform even better. Over the last few weeks, we've added 47,361 U.S. businesses to the Nelso database. Unlike our listings for Berlin or Prague, there is no rhyme or reason to these listings; in some cities like New York we have fairly comprehensive listings, and in other cities like Milwaukee, Wisconsin we have listings only for golf courses and pizzerias. So what's the point? Why offer any listings at all if we can't offer the kind of comprehensive data that we offer in Prague? How easy is it to rank for searches for U.S. businesses in languages other than English? That is, how easy will it be to rank for the kinds of searches that a German, or Danish, or Czech tourist might do when traveling in the U.S.? 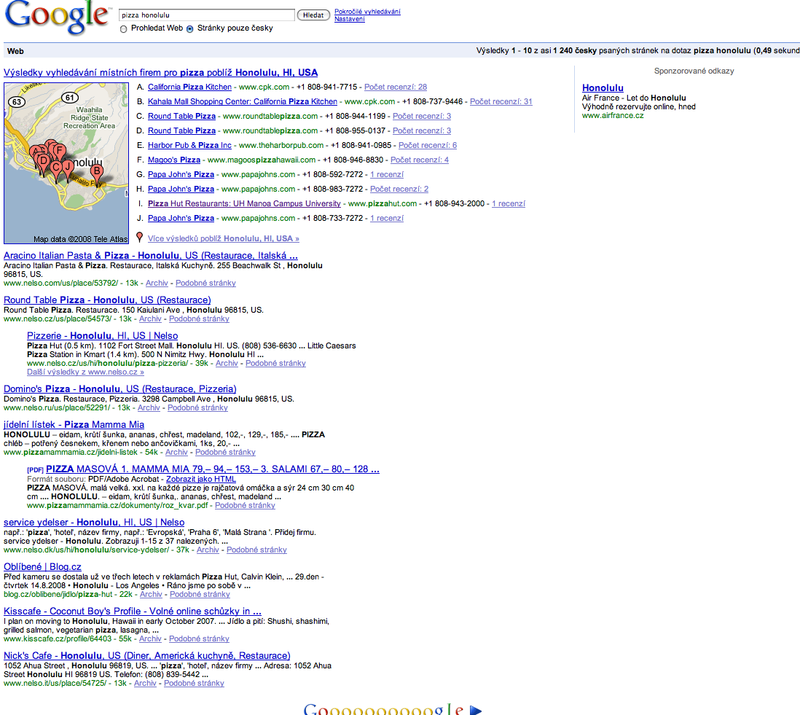 If we can succeed in ranking for U.S.-travel related searches, is this a big enough market to care about? When a Danish speaker visits Chicago, does she even bother trying to search for information in Danish, or does she assume that no information will be available in her native language and start her searches in English (negating our advantage - it will be a long time before we can rank well for searches for U.S. businesses in English)? Well, I think we have an answer to question #1 (above): it is not terribly difficult to rank well for searches for U.S. businesses in languages other than English. A recent search for "Pizza Honolulu" on Google.cz brought up some rather astounding results: Nelso sites represented 6 of the first 10 results for this search (screenshot)! It'd be hard to achieve better ranking than that. So what about question #2 (is this a big enough market)? We still don't have enough data to say conclusively if European travelers to the U.S. can justify the expense of developing comprehensive listings for U.S. cities. Our "gut feeling" is that this market is big enough. At Nelso, we define our addressable market as "All travelers that do not speak English as a first language". Seems like a pretty big market to us. We've completed production of our second business video, this time for the Museum of Communism in Prague. We'll be producing many more videos, but the format will be similar to this one and the one we produced for U Malého Glena. We're going to start producing a series of videos about Prague (and later Copenhagen and Berlin) restaurants. Below is a test I did to see how the lavalier microphone was working. Video quality and sound quality seem OK, especially when using the clip-on microphone. Oh, my beautiful URLs! Ruined! Although we are using a number of SEO (Search Engine Optimization) strategies on the network of Nelso sites, one of the hardest to get right is "clean" or "pretty" URLs. There is some debate as to whether these kinds of URLs really help in terms of ranking on Google or Yahoo!, but in the interest of completeness we do try to keep the URLs on Nelso as "clean" as possible. What is a clean URL? Well, it's an internet address that looks like http://www.nelso.com/cz/prague/cafe/ instead of http://www.nelso.com/search/?page=4&where=Praha&type_id=10. The idea is that it is easier for both humans and search engine spiders to see that the first URL is about cafes in Prague. The second URL ("places of type 10 in Prague") is more or less meaningless to both the GoogleBot and human beings. So, what's the problem? Well, the above URL system worked fine when the site was entirely based on Prague, and worked well even when we expanded to a select number of cities in Denmark and Germany. The problem started when we decided to expand into smaller cities in both Europe and the United States. Take a look at this list of Czech cities (in Czech: "města"). Do you see what I see? Yes? The fact that the same city name is used as many as 10 times for different cities in the same country? For example, take the case of the city of "Albrechtice". Our usual URL scheme of http://www.nelso.com/cz/albrechtice/ is not going to work in this case because "Albrechtice" is the name of nine different cities in the Czech Republic! There would be no way with the former URL scheme (e.g. http://www.nelso.cz/cz/albrechtice/) to tell exactly which "Albrechtice" the user wants. To solve this, I've been forced to add a number identifier to the URL, so that the Kladno near Prague will have an URL like http://www.nelso.cz/cz/kladno-g3073699/ and the Kladno on the other side of the country will have an URL like http://www.nelso.cz/cz/kladno-g3073700/. Not nearly as "pretty" as the former way of doing things at Nelso, but this is the only way this is going to work as we move out of major cities and into smaller cities. The one exception will the be the U.S. - in the U.S., there are as far as I know no duplicate cities within a state, so we can still use nice URLs like http://www.nelso.cz/us/ny/new-york-city/ when referring to U.S. towns. Even in the non-U.S. URLs, we're still stuffing the city name in the URL, so hopefully this won't hurt our search engine rankings too much. A few days ago, I received a somewhat frantic email from the staff of the Hotel Olšanka. They were complaining that Nelso.cz was ranking #1 for searches for "bazén Olšanka" ("Hotel Olsanka swimming pool"). I didn't think much of it, until I received a phone call this morning from the director of the hotel. She said that the problem is that Nelso.cz has listed her personal mobile telephone number as the number for the swimming pool, and that her phone is ringing off the hook with people wanting info about the hours of operation of the pool. I feel both good and bad about this little mix-up. The bad part is that we annoyed the director of one of the biggest Prague hotels. The good part is that Nelso is obviously working - people are using the site regularly to look up addresses and phone numbers for businesses in Prague.